Tutorial: How do I create a Photoshop colour theme? In today’s post we show you how creating a theme from a photograph and installing it as swatches in Adobe Photoshop is much easier than you thought! 1. 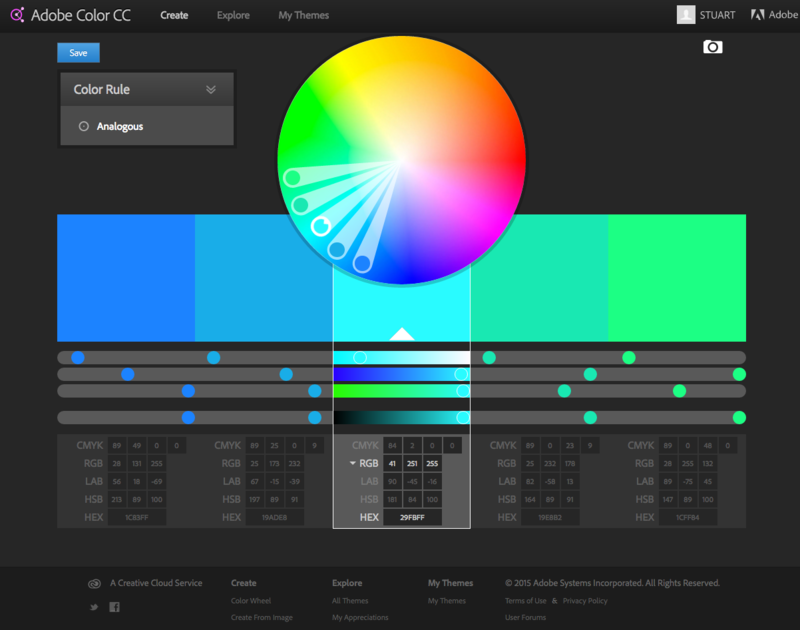 Go to adobe’s colour theme generator at color.adobe.com. If you already have an Adobe ID, that’s great. If not, you can always create a free one to make and save creations. 2. Choose your image by clicking the ‘Create from image’ icon. Navigate to your desired image file and upload. 3. When your picture loads in, Color will choose a default colour set from one of its Color Mood settings which, as you can see, can be very different from each other for just one photograph. 4. As none of the colour choices have really grabbed me, I’ve moved some picked colour points around to achieve a different theme. This is easy to do, just grab one from the picture, and put it where you want it. The colour is live and will change when you move it, so you can see how it fits. 5. All you need to do before we get it into Photoshop is save your colours. 6. If, after you save, you find that you want to change anything, you can click the ‘edit copy’. 7. On the edit screen, you can change everything about the theme and re-save it when you’re happy. 8. As you can see, when you click on a single colour, there are multiple colour breakdowns which are changeable using what ever colour mode you are working to. Once you’re done the theme will be saved for import when you open Photoshop. 9. Moving onto Adobe Photoshop. Open the theme palette Select Window > Extensions > Adobe Color Themes. 10. Your save will appear in the theme palette and is editable without having to leave Photoshop. You can also view it again online. 11. What we really want to do is use it, so under the dropdown menu select ‘add to swatches, and each individual colour will appear in your swatch palette (which you can open by going to Window > Extensions). Make sure you are logged in to your Adobe account when you try to open the Adobe Color Theme palette or your themes won’t appear.